I ordered two cables from your store online at Xmas time and expected to get it after Xmas and was very delighted to receive them within two days at Xmas time so congratulations to your service. It is great so much so I have informed friends in WA about you once again thank you. Clean up your four channel speaker set up with the 4 x Speaker Wall Plate Pack from Cable Chick. 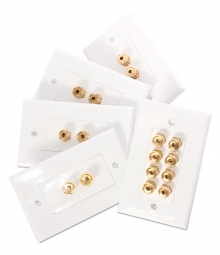 This pack of wall plates is great value; you certainly won’t break the bank with this pack, but you will remove unsightly speaker wire from your audio installation. This pack is perfect as a budget solution to remove wire out of reach from little hands and paws. The 4 x Speaker Wall Plate Pack features removable cover plates for easy installation and painting. Better still, the binding posts require absolutely no soldering. That means no fiddling and no hassles! These speaker wall plates have been specifically made for media room installations are perfect for running cables through your walls, floors or roof cavities. Hi there! I ordered a cable (5m Component to VGA) from you yesterday at lunchtime and it was in my hands 24 hours later, ready to use on a festival tomorrow. Thank you!